The inaugural exhibition centres on Kusama's most recent painting series My Eternal Soul. 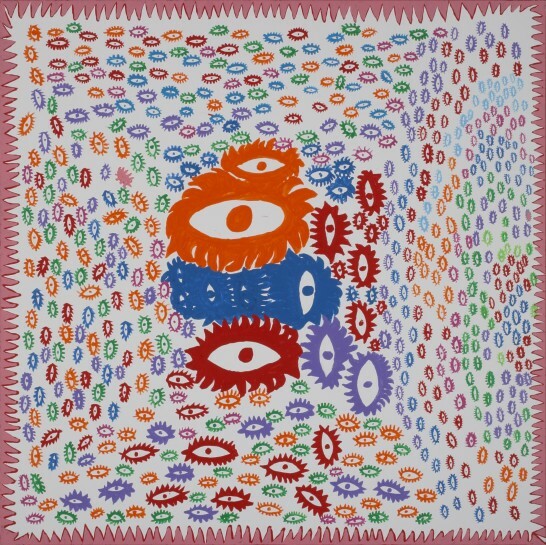 Distilled within the My Eternal Soul paintings are the themes and obsessions that characterise Kusama’s art, encapsulating a surreal and humorous, as well as instinctual approach to art making. Each new work of the ongoing series abounds with imagery including eyes, faces in profile and other more indeterminate forms recalling cell structures, often in pulsating combinations of colour. Some appear psychedelically primordial, other examples bring to mind ancient landscapes and grand geological patterns. Also on display are works from Love Forever a new mirrored pumpkin sculpture and the mirror installation Pumpkins Screaming About Love Beyond Infinity, 2017.